Please note that this current website does not have a shopping cart. To buy our Non-Native Smoked Moosehides online, please go to our e-commerce website at NaturalExotics.ca. These are smoked moosehides tanned in the traditional way by a non-Native tanner. They are freeze scraped by hand in winter, and treated using only natural ingredients. 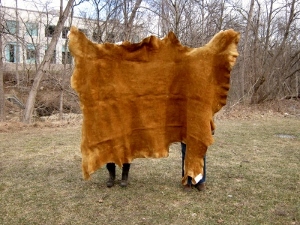 Soft and supple, these hides are usually thick, fall harvested hides, and are perfect for crafting winter moccasins. We sell them as full hides or pieces.